A three episode mini-series from Sweden. 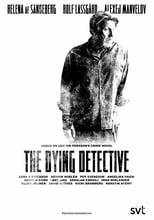 The English title is 'The Dying Detective'. It is based on the 2010 Novel by the same name written by Leif G.W. Persson. Where can you stream Den döende detektiven? On 2018-01-03 Drama/Crime TV Series Den döende detektiven first aired. Written and created by , and produced by SVT Drama, Den döende detektiven will return and was last broadcasted on 2018-01-17.